In my postcard post I didn't include one other postcard I received this summer. 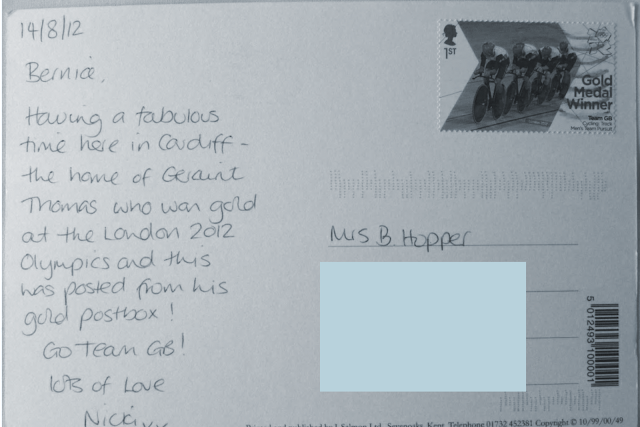 Nicki knew I had been glued to the Olympics (and later to the Paralympics) and I was thrilled that she sent me this postcard with the cyclists stamp on and posted from a gold letterbox. And you can see Nicki actually posting the card here. I have set up a new blog where I will be posting prompts and challenges for the whole month of November. Starting tomorrow there will be Thankful Thursday posts for 6 weeks which will give more information about the hows and whys of gratitude journaling.